Starting your herb seeds indoors will guarantee a productive herb garden. Your favorite herb seeds will quickly germinate under the right conditions and will make transplanting your herbs to the garden easier than trying to get those little seeds to germinate directly in the soil. Your plants will thrive if you introduce your plants early in their plant growth. This is called hardening off your plants. By first setting your plants outside in their growing containers for a few days before actually putting them in the ground will slowly introduce your plants to their environment. The air temperature and variable weather can shock a container plant no matter the variety. After allowing your plants to sit outside for a few days before directly planting them in the ground will not only give you a better chance for almost all of your plants to actually survive but, hardening off your plants will also extend your plant’s life because the plant will get used to the new environment and the leaves will strengthen. Save Money.. . Grow Your Own Herbs! Almost all herbs are easy to start from seed. You’ll sure save a lot of money by starting your own plants compared to purchasing herbs plants at your local nursery. I’ve seen a simple 4” basil plant sell for $3.99. Heck, you can buy two packets of basil seeds for that price! There are a lot of varieties of herbs that will grow easily indoors. You can choose to plant indoors to ready for outdoor planting or simply grow your herbs indoors for easy access. Indoor herb gardens are pretty, bring warmth and lovely aromas into your home and they’re down right cool if you happen to be a foodie or beginning gardener. By growing seeds indoors, you’re also going to find a wider seed selection available to you than actual plants varieties available. That’s always a benefit. I enjoy using Burpee, Territorial Seed Company and Home Depot's varieties. Both Burpee Seed Company and Home Depot guarantee seeds. I think Lowe's does too. Be sure to hang onto the original seed package and receipt. I've actually purchased junk seeds before and wished I would have saved the seed envelope. You can totally enjoy fresh herbs all year long by either growing them indoors, drying or freezing them or if you happen to live in the sun belt knowing which herbs grow best in your hardiness zone. *Here are a few herb varieties that I grow successfully indoors all year round on a kitchen window sill or somewhere else in your home where at least 6 hours of sunlight shines through. Plant seeds are a plant embryo. A seed’s initial food supply is stored within a protective coating. Seeds remain dormant until a combination of moisture, temperature, air, and light triggers germination. Simple moisture and warmth with dissolve the protective coating to allow that energy in the seed to sprout and break through the soil. It will then reach for the sun and its roots will seek out a water source. Planting seeds indoors or out of doors is easy. Follow the planting guide on seed packet. I've been taught to plant seeds twice the depth of the actual seed size. I've been successful by doing so with almost all seed varieties. Many herbs don’t like rich soil. It’s best to mix a bit of your soil found on your property (pesticide free) or mix in some sandy loom. Too rich of potting soil can actually rot the seed or a plant’s roots. Remember to place a few rocks, marbles, or pieces of broken pottery on the bottom of your planting pots. 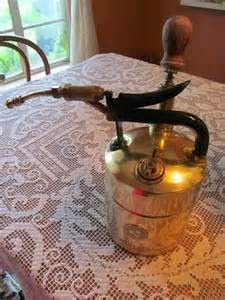 This will ensure that the bottom holes of the pots won’t clog with soil and water can easily flow through. Keep your seeds moist but not wet. Containers often dry out quickly so, check your plants often for moisture levels. If you stick your finger in the pot and no soil sticks to your finger, you should most likely add a bit of water to the pot. Sunlight is essential for growing plants (natural or artificial light is fine) but, heat is more important. Most seeds need a ground or soil temperature of 65F – 95F. In my experience, if room temperature is about 70˚F, you may need to place containers in a warm spot, such as near a kitchen stove, heat vent, or on top of a refrigerator. Some people will place a heating pad under a seed starting container. After the seedlings are up, 60˚ to 70˚F is fine. 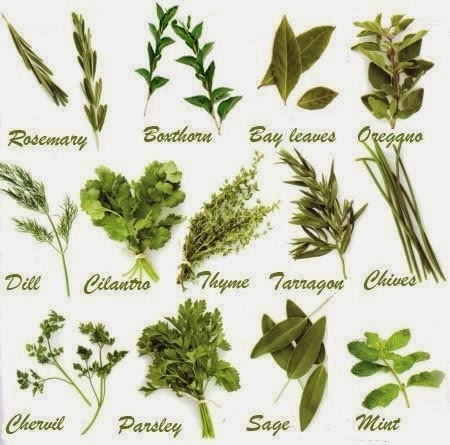 Most herbs like to be clipped often to stimulate growth. I keep scissors in my garden shed and in my kitchen for just that. If you don't clip herbs often, they'll want to bolt. The stems become wood like and the plant will slowly begin to stop producing. Herbs can be dried or frozen. Most people bundle herbs and hang them upside down so that the leaves look pretty and are dried in uniform. I like to freeze herbs. Simply spread the fresh cut herbs on a cookie sheet and freeze for a few hours to overnight. Then I place them in a freezer bag. If you don't separate and spread the herbs out on a cookie sheet first before freezing and just stuff some in a freezer bag, you'll have a herb ice block on your hands. You can take a poor man's soup (stone soup) and make it taste like a meal made for a king with a teaspoon of any herb. Herbs are wonderful in soup, breads, casseroles, pasta, meat, poultry or simple potato dishes. Be adventurous with herbs. I decided to grow herbs myself one day when I decided to change up my macaroni-spam-pea-cheese salad. I put a few tablespoons of fresh dill in my macaroni-spam-cheese- pea salad was amazed how a tablespoon of dill can pack a punch of flavour. Most herb plants plants don't need much water. I usually play it by ear.. . or rather by finger to determine if I need to water. Simply stick your finger into the planter or pot. If your finger comes out dry with no soil on it, give your plant a good soaking. 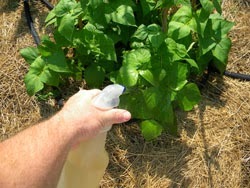 If you watch your plants moisture level, a simple misting of water should be sufficient enough. Simple tap water is OK but, I recommend allowing your water to sit for at least 15 - 30 minutes to allow the chemicals in the water to settle or evaporate. If you're going on vacation for a week or so and you have no one to water your plants, I recommend putting all of your house plants including herbs into your kitchen sink, bathtub or Rubbermaid containers. The pour a few inches of water into the container. The plants will slowing absorb the water from the roots up. It's a hydroponic technique. Potted plants usually need more water than plants in the ground. Keep an eye on your plants or you'll be sorry. Dry or arid climates can really zap the soil moisture from a potted plant overnight. My favorite fertilizer even for indoor potted herb plants is manure tea or compost tea. I like to place each pot into my kitchen sink and give them a good soaking of manure tea that has been strained. I sometimes spray the leaves as well. The plants do have a bit of an organic smell for about 30 minutes but, it's tolerable. It's absolutely ok to also use Miracle Gro, Vigoro or Jobes liquid or crystal fertilizers. I've used both Jobes and Miracle Gro's plant sticks. You simply push them into the pot for slow release fertilizing. Fertilizing sticks are great if you're going on vacation. Many peat-based seed-starting mixes repel water when they dry out completely. Pre-moisten the mix by putting some in a container or bag with a small amount of warm water and stirring it well. Allow the peat-based starting mix to completely absorb the water before placing it in a pot or container. Always keep the peat-based starting mix moist otherwise, you’ll regret it. Your seeds or plants will be truly affected. I usually mix 50/50 potting soil and my outdoor yard dirt. I've noticed over the years when I use too rich of soil, my herb plants are harder to take care of. The soil doesn't seem to drain as well will pure potting soil, the plant leaves seem a bit yellow. I think herbs actually don't like rich soil. My herbs outside are planted in sandy loom that's been enriched with cow manure. Nothing fancy and varieties as like Italian Genvieve basil to dill bouquet does just fine. It's a good idea to know the difference between soil and dirt. Soil has been enriched using organic material. It's usually darker and richer than your ordinary yard dirt. And dirt.. well, it's ordinary dirt that sometimes needs to be amended. My yard dirt is more like sand. I can pretty much grow anything in it but, my potted plants need soil or amended dirt for good drainage. Since their growing space is limited and their roots aren't allowed to spread and seak out water.. . you have to help the plant along by giving it a bit of extra nutrients and water. 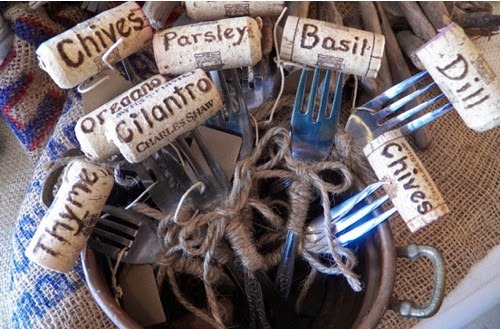 Herbs are a great addition to cooking and their fragrance bring joy and emotion to any table, room or yard. Have fun with growing herbs indoor or outdoor. Herbs don't mind growing in whimsical pots, wheel barrels, boxes, shoes or re-purposed containers. Grow them on a wall, a pathway, window box or what have you.